Although I've actually never really planned to live in Istria, this is the place I call home for now. And man, I could have hardly chosen a better place to live (especially considering it was more of a gamble than a real plan). If you are curious about the things I cherish here, check my article on awesome things about living in Istria. Istria is a north Adriatic region of Croatia. It’s a heart-shaped peninsula which means that not only we can visit the entire peninsula (seaside and a hinterland) within one hour drive from our house, but we can also visit three countries (Croatia, Slovenia, Italy) within one hour drive. Istria offers so many pretty and outstanding places to visit. We often get in the car without a particular place in mind and just take any local road in search of a new exceptional corner of this beautiful region. And although we have been living here for nine years now, Istria keeps surprising us with its allure. The hilltop towns with its spectacular views over the countryside are so typical for the region. Trust me Istrian hilltop towns and the vistas stretching all the way to the sea are breathtaking. There are so many of them, and although we do call them towns because of their urban layout and a feel, their size is more of a small village than of any town as we know it. Here are our some of our favorite Istrian hilltop towns. If you you are interested in visiting some charming villages beyond Istria, check our post on 14 enchanting villages in Croatia that you need to visit. We start with Groznjan, because it’s our favorite of all Istrian hilltop towns. This medieval town remained largely untouched. It sits on the hill, a 228 m above the sea level, and it offers amazing vistas over the Mirna Valley, olive groves and vineyards, the sea and the coastline from Novigrad to Umag. As you drive up toward the town, you pass beautiful olive groves and vineyards. Stone used to build houses and other buildings is different in shape and color than the stone used in other areas of Istria. You’ll notice this immediately, and it’s kind of nicer. The town has a typical medieval layout, houses are built very close one to another, streets are cobbled, with lots of small alleys, and the town is walled. Groznjan is a town of art. The popular summer jazz festival & school takes place here every summer. There are lots of art galleries too. Groznjan is also full of stray cats. Motovun is the most popular of all the Istrian hilltop towns. Located on a 280 m high hill above the Mirna River, this town and the surrounding area is famous for the black and white truffles you can find in the nearby forests. Motovun film festival takes place here every summer. There are few bars, art galleries, souvenir shops, and restaurants in Motovun. Restaurant Mondo has been featured in a New York Times, and it’s on my restaurant wish list. But we still haven’t tried it out. My friend runs a small B&B in Motovun, called Villa Borgo. Check him out if you plan on staying in Motovun. Završje is the most mystical of all the Istrian hilltop towns. This is quite a big village, but it’s been mostly abandoned. Today majority of the houses are covered in creeping ivy. There is also interesting leaning bell tower. Not quite like in Pisa, but it leans 40 cm. There is a nice local inn nearby offering very affordable, tasty homemade food. Oprtalj is another charming medieval town located above Mirna Valley. Just out of the town walls, there is a nice Venetian loggia, offering beautiful views over the neighboring hills, and olive groves. Compared with other hilltop towns, Oprtalj seem to be more colourful. Many houses have bright colored facades. There are still many more houses in need of restoration. If you like olive oil, visit two famous olive oil producers in the vicinity of Oprtalj. Zigante is in the village of Livade, and Ipsa is in the village of Ipsi. Boljun is a small, fortified town located in Central Istria, below the Ucka Mountain. The town has a really large and well-preserved medieval Castle. I love the view through castle’s windows – beautiful vistas over the Boljuncica valley and Ucka Mountain. There is a small restaurant in Boljun. Gracisce is another medieval hilltop town located in Central Istria. I don’t know the full story of this place, but there are two things that intrigue me about it. First, there are way too many churches here for such a small place. And second, near the main church there are some gravestones with skull and crossbone sign on them. And this is something I haven’t seen anywhere else in Istria. I tried to find out at the local tourist office what the origins of this symbol in Gracisce were, but they haven’t known much about it. However, Gracisce is very cute place to visit. It has a grocery store, bar, and a restaurant. And every year for Easter weekend, a very popular Grasicse Wine Faire takes place here. It gets really crowded, hustle to find a parking, but it is an interesting event to attend with a great atmosphere, and lots of fun. I’m looking forward to a short holiday to Croatia (Rovinj) in August with my two children 8 and 11. We plan on renting a car and these hill top towns all look amazing to explore. Do you have any suggestions as to which town would have the best scenery along the way? they all do: Groznjan, Motovun, Oprtalj, Gracisce, etc. The gravestones in Gracisce with the skull and crossed bones are most likely a “memento mori” (Remember that you are mortal) from the baroque period. So this message is adressed to the contemporary observer. This does not explain why similar gravestones can’t be found (any more) in the rest of Istria, but inside old churches and especially in monasteries you occasionally find similar gravestones here in the south of Germany. Here, they often date from the 17th century when Germany was ravaged by the 30 Years War and lost a full third of its population during that period. The living then were very much aware of the fact that they, too, might die any time. I wonder, though, what Istria out of my Window has found out about these gravestones in her book. Should we have a GPS so we don’t get lost? Thanks for all the info on hilltowns- My friend and I are spening 4 days of out two week trip to Croatia in Istria summer 2015 so I have dutily made note of the places you mentioned. If anybody knows of anymore please let me know. They all sound so wonderful. Hi Brenda, yes, Istrian hilltop towns are really special, very scenic, and mystical. A must-visit when you come to Istria. 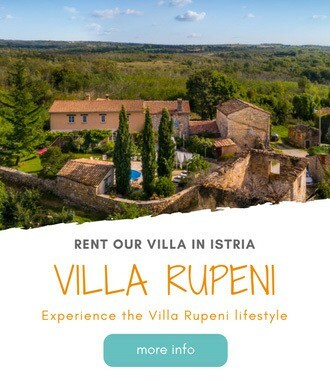 We’ve got lots of info on Istria here on our blog, but do let us know if you need any specific information. We’ll be happy to help you plan your time in Istria. I remember going to a concert with my uncle in Slovenija and driving through Istra to get to the place because it was summer, and summer was spent on Krk. My uncle was very confident he knew how to get to our destination that he refused the map… until we stumbled on a place called Sveti Petar u Sumi and wondered “What the hell…?” Luckily, it didn’t take us long to find the right way, but it was interesting to stray from the main road and just drive through the back roads of Istria. Lovely scenery. Hahaha, Ana! The same thing happened to my father-in-law. He was visiting us in Istria. And he is impatient Dalmatian (important for the story). Anyways, he was turning like crazy, couldn’t find a road to Porec, and any turn he took he was seeing Sveti Petar u Sumi sign (like it’s the center of the world). Anyway, he refused any help, and was ready to drive straight back home without even reaching Porec. Luckily, the road he took finally got him to Porec, and not to Dalmatia. So quaint and beautiful! Love the ivy-covered walls. Several years ago, my husband and I went on a Rick Steves trip to Croatia. It was so wonderful, we stayed in Motovun 1 night and absolutely loved it. (I about died walking up that hill !!) An internet friend of my husband took us to Groznjan, it was enchanting. We were there a little more than 2 weeks and saw so many places,met so many wonderful people. I keep saying I want to go back not just to visit but to live there for at least 1 year. Your photos bring back many splendid memories. Thanks for stopping by, Barb! Glad you like Istria so much that you want to move here at least for a year. I would love to hear about your experience during that Rick Steves trip. Thanks, Gina! Glad you like it. If you decide to visit, please do let us know if we can help with anything. We like your blog too. Of these I only know Motovun. Groznjan and Završje look really interesting. I’m going to have to work these into my bike route. 🙂 Thanks! Yes, Bob! There are many more. I’ll make a part 2 and list some other hilltop towns. They are really cute and worth visiting. stunning – these really remind me of the south of france, peillon and peille and st paul de vence etc – lovely to see more similar villages to visit, they are so pretty! Thanks, Anna! True, there are lots of similarities in those Mediterranean villages. Thanks for heads up on these two in a south of France. I love discovering cute little places. Will check them out the next time in France (we visit the area at least once a year). Wow, I could have written the same list – I love all these places – though I haven’t been to Boljun and now it’s going to the top of my ‘to see list’! I’m glad to see my little village Gračišće here too 🙂 About the tombstone – I was recently given a book on ‘Istrian tombstones’ (believe it or not) and there’s a photo of the skull and crossbones one in Gračišće. I’ll check and let you know what it says! Thanks, Isabel! Your post on Zavrsje is lovely too. Was thinking of you guys when we walked in Gracisce. And yes, please, let me know if you find any info on tombstones in Gracisce. Really curious about that. After reading the tombstone bit in the village of Gracisce it reminded me that during a quick stop in Buje we found similar markings on the tombstones. There was a small cemetery overlooking the valley below with several the same described tombstones.